Miles Davis, trumpet; J.J. Johnson, trombone [1-2]; Lucky Thompson, tenor sax [1-2]; David Schildkraut, alto sax [3-5]; Horace Silver, piano; Percy Heath, bass; Kenny Clarke, drums. 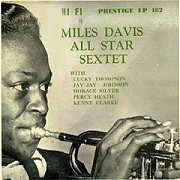 This all-star session is among the key recordings in the history of modern jazz and the saga of Miles Davis. "Blue 'n' Boogie," the Gillespie blues classic, is treated to an up-tempo ride. This date was one of the first real studio "jams," with space for everyone to stretch out, and Miles, J.J., Lucky and Horace average nine choruses apiece. Dizzy's original riff gives Thompson his send-off and there are nice background touches behind the soloists throughout. The rhythm section works flawlessly. Miles returns for two choruses, and Klook has his say with the ensemble. "Walkin'" (also a blues, based on a piece known as "Gravy" when Gene Ammons first recorded it in 1950) is the masterpiece, however. At a more relaxed tempo the soloists preach brilliant sermons; Thompson may never have played better. As for Miles, he sums up why 1954 was a banner year for him. Not so incidentally, "Walkin'" became a cornerstone of the hard bop movement. This marks the beginning of the Davis romance with the mute. He employs one throughout, although it is a cup mute rather than the Harmon that would soon become his trademark on ballads, especially on the melody statements. No trumpeter has put the mute-mike combination to better use. (It was Duke Ellington, whom Miles adored, who first discovered that the microphone could be an added tone color--on "Mood Indigo," in a recording studio in 1930.) The cup mute has a rounder, less penetrating and less biting sound than the Harmon--a different color. The new and potent rhythm trio of Horace Silver, Percy Heath and Kenny Clarke was unveiled here. Also on hand was little Davey Schildkraut, a fine altoist in a Parker mold. (He was once mistaken for Parker by no less an expert than Charles Mingus, in a Blindfold Test, on a record from this date--"I'll Remember April.") He had worked with Kenton, Buddy Rich, and George Handy among others, but was already holding day jobs to support his family, and dropped out of musical sight in the early Sixties. His presence here assures him a place in jazz history, but you can't eat that . . .
"Solar," [mp3] a most attractive Davis line on "How High the Moon" changes, is sped by Clarke's fine brush work. 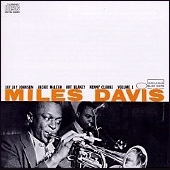 Miles solos first, crisply, then alto and piano, then Miles returns for the landing. "You Don't Know What Love Is," an Eckstine feature in the Earl Hines book, can become mighty doleful in the wrong hands, but Miles here reminds us of Gil Evans' remark: "Underneath his lyricism, Miles swings." This is a trumpet feature, after the effective bass-piano introduction. "Love Me Or Leave Me" is taken at a brisk clip, Miles transforming the melody even as he states it. Silver's piano turn is framed by ensemble touches, and then Miles launches a driving solo, urged on by Silver's jabs and Clarke's brushfire. Schildkraut is inventive and swings, with a rounder, softer tone than Bird but much fluency in the ornithological idiom. Silver returns, with that unique propulsion and some Bud Powell quotes; Miles trades fours with Klook for two swift rounds and takes two more of his own before the ensemble ending, bridge by Percy Heath. Joyful stuff. This was no slapdash blowing date, but a session more cohesive than most organized groups could manage. 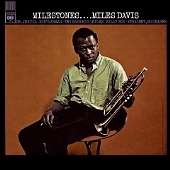 And it is certainly worthy of notice that this was the first Miles Davis session (and quiet possibly the very first Prestige session) recorded by the remarkable, optometrist-turned-engineer, Rudy Van Gelder, who presided over the controls at virtually all Prestige, Savoy, and Blue Note dates for may years and must be considered the definitive bebop recording engineer.